(Day 5 of 5) There was some smoke in the night, but not much. There still is not much in the air as the morning comes. My procrastination about getting up is interrupted by a double bladed helicopter heading south from Florence Lake somewhere. Twice as loud as the average helicopter. I figure it is something to do with the firefighting effort, but it is actually picking up some of the last Search and Rescue teams after finding their missing hiker battered and hungry, but otherwise in good shape. I thought I would just make my own way last night, but now I want to find the junction. Before starting, there are a couple points it seems prudent to put into the GPS to help navigate. One is for a big bend in the trail and one for the lake itself. Heading downward, there is a blaze and another and behind me another one. Blazes were rare yesterday. I saw about three and one was a newer single rectangle by someone with a hatchet and not a lot of experience with blazes. Today they are all over. I must have camped within 50 feet of the Hot Springs Pass Trail, the one I had meant to come up along. I follow it down until something looks vaguely like a trail in my direction. It wanders and eventually I just work my way downward toward the stream below finding a nice campsite and flowing water. Up on the far bank is something that looks a lot more like a trail including a few more blazes. The little stream coming into Boulder Creek. Rest assured, there is an obvious trail up on the other side of it. This would have been a very fine place to camp last night after all. I nearly fall in crossing on a log that is unexpectedly slick. Too many logs that get a lot of feet can lead to bad judgements when crossing something that few or none have crossed. Heading down toward the junction just to see yields nothing. The trail passes below the confluence rather than above as shown on my map. Boulder Creek has great flow here. I can spot no indication of the Hot Springs Pass Trail heading down or up although I know it is there going up. The Thompson Lake Trail is easy enough to follow at this point. It mostly satisfies my curiosity, but is not getting me where I want to go, so I turn back toward the lake. 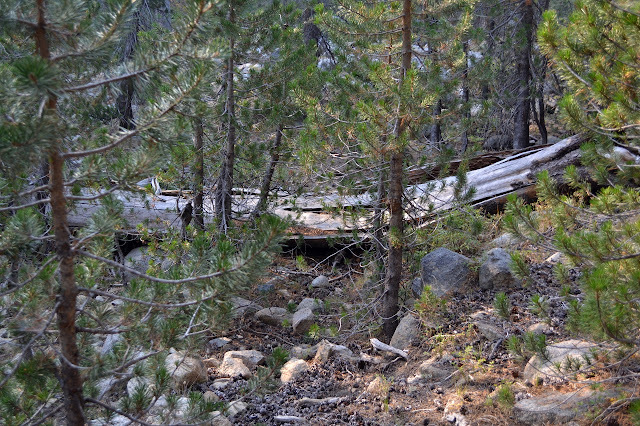 There are plenty of bad spots like this very old downed log across the trail and the encroaching pines, but the Thompson Lake Trail can be followed. (Day 4 of 5) Sipping a bit of water helped deal with the effects of smoke in the night and the morning is clearer again. I have decided to poll the hikers I meet as to if they are through hiking or not. 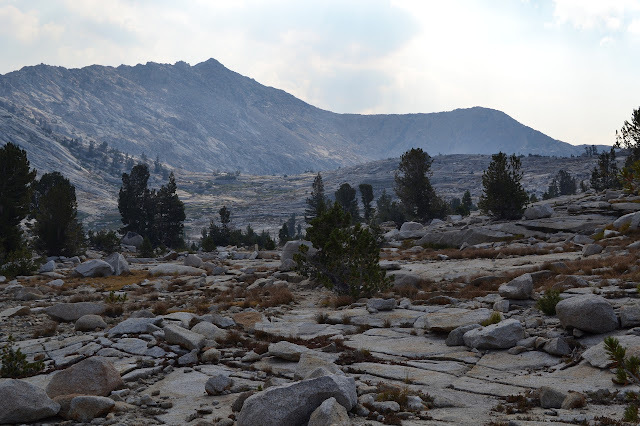 The two that were already at the site are JMT sobo hikers (John Muir Trail south bound) and the two who came later are the same, but hit the greater smoke to the south and are now bailing out at Muir Ranch. 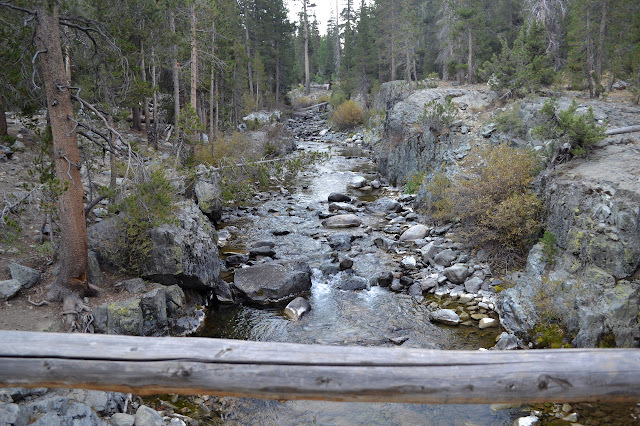 Crossing the bridge over the low South Fork San Joaquin River. The sign at the junction says it is 16 miles down to Florence Lake, probably meaning the trailhead, and that is essentially all downhill. I thought yesterday afternoon was a long time going downhill, this will be longer. The lost elevation is much less. A piece of the trail. It is still a little smoky out, but not so bad. 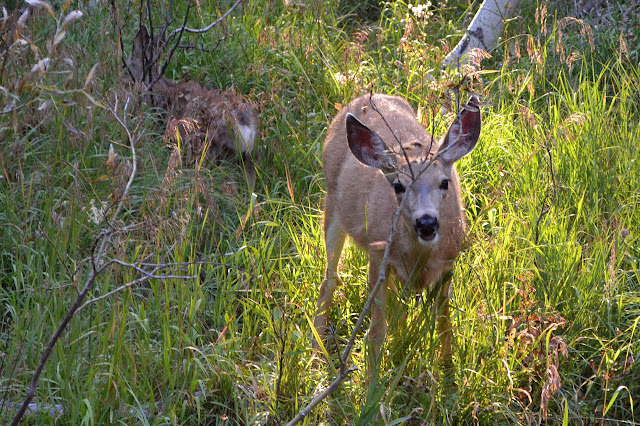 The deer in the park can be very relaxed. (Day 3 of 5) It is 2 AM and I have woken up not comfortable at all. The smoke is making my nose run which is just enough to dribble down my throat and my stomach is reacting with heart burn. Maybe I should bail. Smoke is not a healthy thing. Pulling out the map, it looks like I could get back to the car in a day. It would be even easier to do so if I get the part I already know done now. I am not sleeping or even feeling sleepy. Packing is easy and quick. Under the moon, I do not even need my head lamp. It is curious how the trail stands out in the low light as a lighter line, even as it passes over the rocks. Very small particles ground out by the passage of many shoes scatter the light a little better? It seems plausible. Whatever it is, it makes the trail easier to follow than it was in the daylight. Of course, knowing where it goes helps too. I keep on going down and up the little climb and down into the trees. I am much more comfortable under the trees and the tired is returning, so when I flat spot a half mile short of the junction marking the last of what I have hiked pops up, I grab it for the rest of the night's sleep. 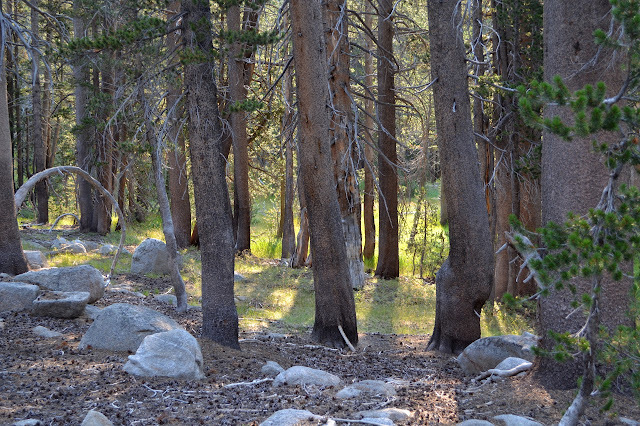 Under the trees is much more comfortable and the light finds me well rested and much happier. It might be because the smoke was clearing out again. I head down the rest of the way to the water just before the junction to cook breakfast since I dumped the extra in the night knowing there was water here. My spoon is not in my cook kit. My spoon is not anywhere. I bought a second set of these Light My Fire toddler sized sporks just so I could have the translucent turquoise one which I have used for a grand total of five meals and it is not there. First, how do I eat my couscous? A granola bar wrapper folded in half works out surprisingly well. And eventually I decide I will go back. For a spoon. Passing by the short spur trail to Dale Lake for a fourth time and ignoring it seems unkind to the poor lake and the trail is becoming very familiar. Back to Lake Disappointment. The lesser smoke in the air allows the walls around the Devil's Punchbowl to be visible as well. Back at the lake, I head down to my site. Which is clean. I came down a different way and it somehow does not quite look the same for having approached it the "wrong" way, but there is the rock I cooked on and there is where I slept half the night shown with some scuff marks in the dirt. I head back up to my back and pull out everything and open up everything to see if it found a new spot, then head back, this time along the original route, to my campsite. Searching some more, I find myself quoting The Matrix in various intonations to make Shatner proud. "There is no spoon." Some creature must have helped my pack up without it. I have come back some 2.5 miles for a spoon that is not even here. Well, I am going to get something out of this extra walk. I am going to Hell For Sure. Not all that much more climbing to the lake and just a bit more would go right on over. A few ponds on the way between the two lakes. (Day 2 of 5) The new day dawns fairly clear of smoke. I had an inflatable mat that would have been more comfortable, but it turned two and decided to develop more pin holes every day. For a night on a basic blue mat embellished by marmot, this was pretty good. A bit of breakfast and gathering up my temporary home making and I am ready for a little more climbing through the trees. It does not take long for these to open up into meadow and then get decidedly wetter. A little meadow through the trees in the morning sunlight. 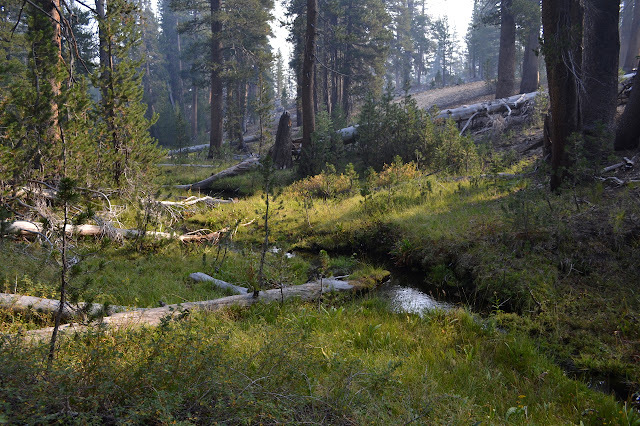 Meadow Brook as a brook through a meadow. 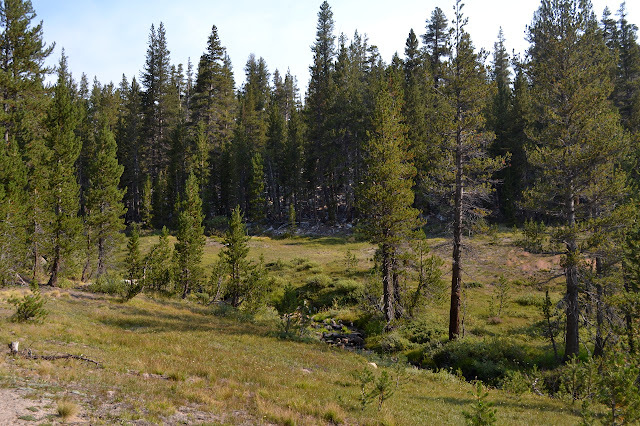 An expansive meadow including a large pond and a couple smaller ones further up. 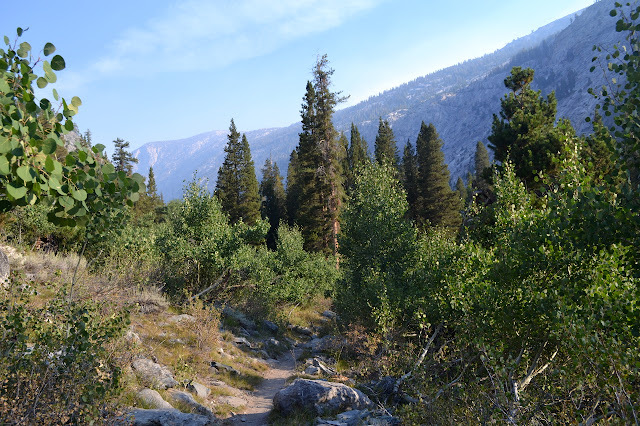 (Day 1 of 5) I was dithering greatly about where to go backpacking next as it is a brilliant time to be backpacking, especially in the Sierras. I am still looking at Blackcap, but a new variable has come into the equation: the Rough Fire. The Forest Service has closed the area south of Crown Valley, which is just 2.5 miles south of Woodchuck where I would enter for that. I decided to move a little bit north to Maxson and I would go to Hell For Sure. (You know someone named it just so they could say that was where they were going.) I am looking froward to having a trip where the trails are fairly easy to follow. Getting my permit the day before, I was told that Woodchuck was closed for air quality concerns. That is worrying. The air did not look all that good yesterday, but it is better this morning. The lot is practically empty. There are three or four other private cars, a lot of Fresno County Sheriff, and a horse trailer marked Search and Rescue. A picture of a missing hiker is taped to the kiosk. The only movement around the place is the gentle drift of smoke and a flutter of activity as two rangers drive up, check my permit for the look of the thing, and head off to do whatever it is they came to do. Looking up at a small dome beside the trail and below the road. The smoke certainly accentuates every little bit of distance. I head down what turns out to be the stock trail which joins with the hiker trail the rangers took just below the parking lot. It parallels a jeep trail that takes off from the road just before the lot before joining that too for nearly a mile. After enough elevation has been lost, the trail breaks off again through a blocking tree and wanders over a few boardwalks. 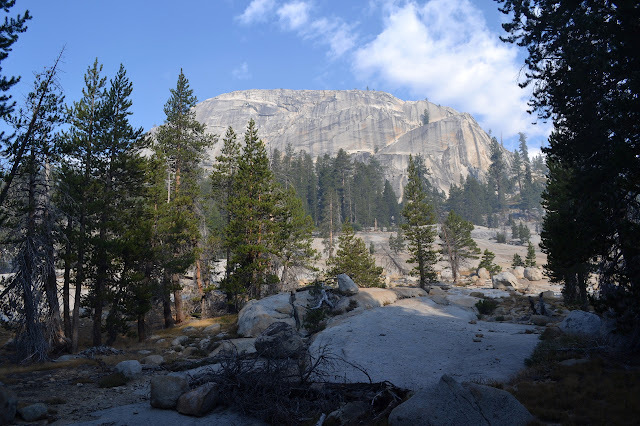 Granite domes peek through the trees at the side as it starts to climb again. 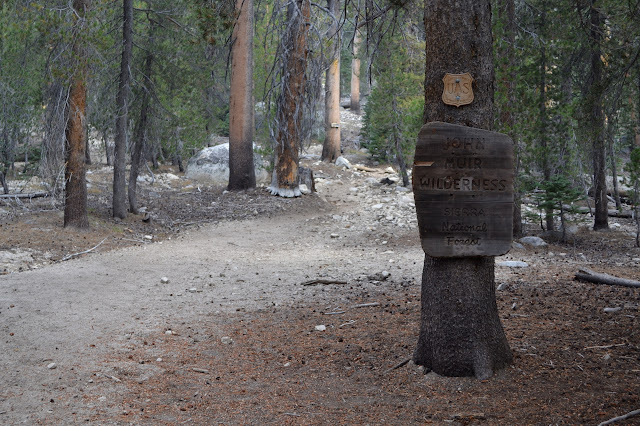 Small signs mark the John Muir Wilderness at the edge of the trail before it finally enters it properly. 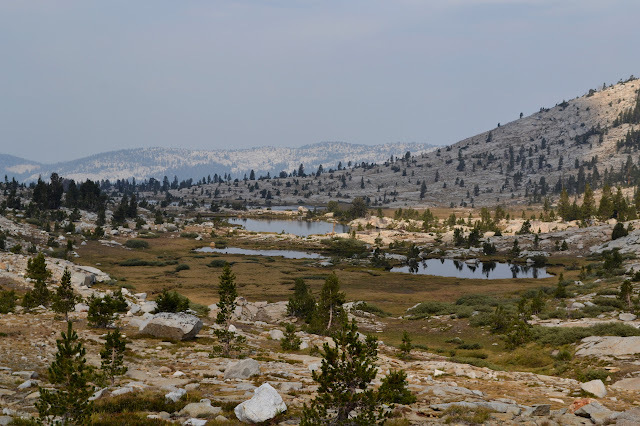 As usual, I am already a little hungry and stop a few minutes at the junction to Hobbler Lake, nodding at the rangers as they come back from there carrying a shovel. 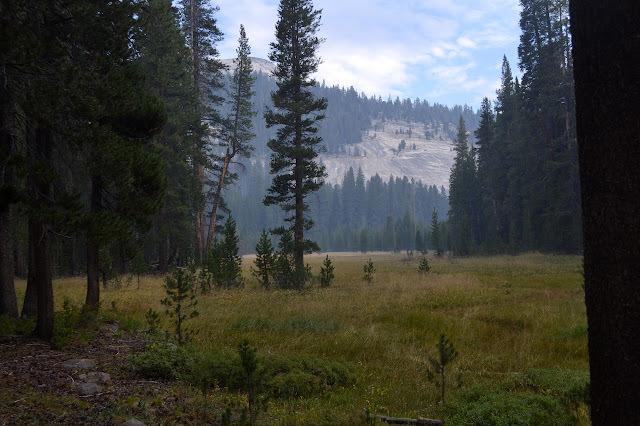 A lovely little meadow for daytime pleasures only as the signs nearby say "no camping here". It is still too hot to leave the ocean, at least not for something short of 10,000 feet, so may be a good time to go exploring El Capitan State Beach. It is so close, but I have only zoomed past noticing how busy the campgrounds always seem to be. 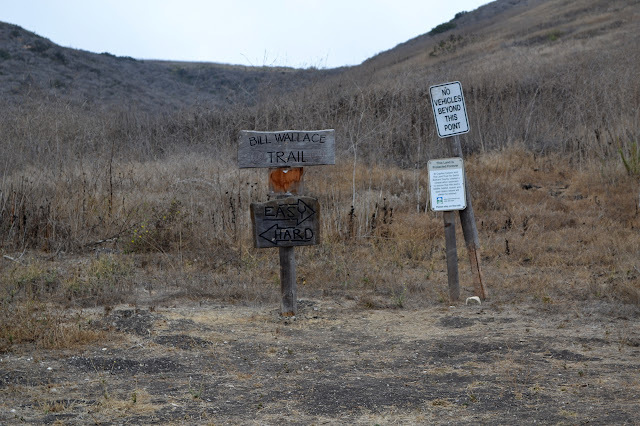 Download the park brochure and you will see that there is a small trail system on the bluffs above the ocean and a much larger system around the canyon north of the freeway. James Wapotich wrote about this trail a few years ago. Parking is located at the entrance to Oceanmesa Campground. Half of it seems to be taken up by some construction currently, but there is plenty left for a lone hiker. I head out along the edge of the campground straight out to the hills that rise behind it. Here, there is a junction marked simply "easy" and "hard". The left is the trail marked on State Park Service map that climbs and wiggles to a view point. The right is actually marked as a road on the map and just makes a big loop around the side of the view point. I figure I am on a loop so will just be up one and down the other and turn for the "easy" route. 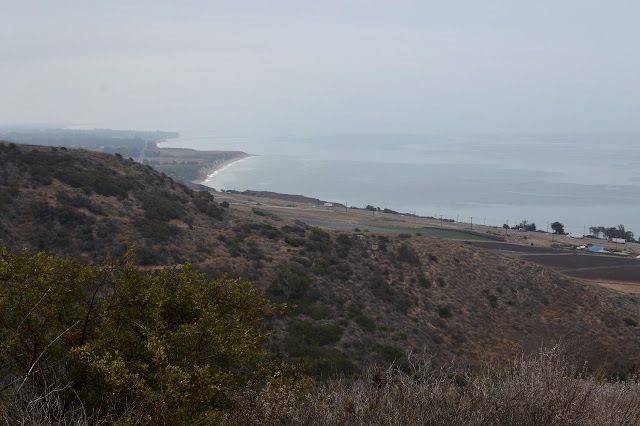 The slow climb provides increasingly expansive views of the coast, still in fog, and glimpses of the canyon, almost entirely obscured by clouds. Some fog obscures the coastline, but trail on the other side of the canyon is clear enough from here. It is quickly clearing off and more and more canyon is visible as I come around the bend to where there is another sign for the "easy" and "hard" way. Guess I will not be going on the other trail on the way down after all. 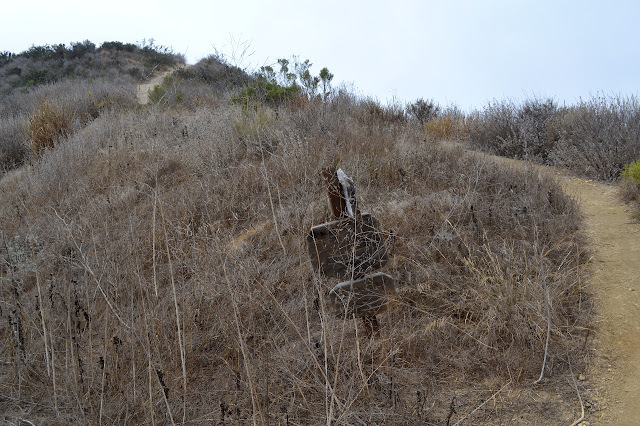 It is a short and very steep scramble along the trail up to the nearby view point and does not gain much view of the still clearing coast. I pick my way down again carefully and head north along the gentle roll of hill. The hard way comes steeply down off one last hill to join the easy way.